MOVE/MRI. COM-WNP (Multivariate Ocean Variational Estimation system/Meteorological Research Institute Community Ocean Model—western North Pacific version) uses MRI.COM as ocean model. The layer thickness near the surface follows surface topography in this z-coordinate model (Hasumi 2006). For the nonlinear momentum advection, the generalized entropy-preserving scheme (Ara-kawa 1972) is used, which is based on the concept of diagonally upward/downward mass momentum fluxes along the sloping bottom. A biharmonic operator is used for horizontal turbulent mixing. A biharmonic friction with a Smagorinsky-like viscosity (Griffies and Hallberg 2000) is used for momentum. The vertical viscosity and diffusivity are determined by the turbulent closure scheme of Mellor and Blumberg (2004). The model domain spans from 117E to 160°W zonally and from 15°N to 65°N meridionally. The horizontal resolution is variable: it is 1/10° from 117°E to 160°E and 1/6° from 160°E to 160°W, and 1/10° from 15°N to 50°N and 1/6° from 50°N to 65°N. There are 54 levels in the vertical direction with thickness increasing 1 m at the surface to 600 m near the bottom. Oceanic states at the open boundaries are replaced by those from a North Pacific model (MOVE-NP) with a horizontal resolution of 1/2° (one-way nesting). A sea ice model with the thermodynamics of Mellor and Kantha (1989) and the elastic-viscous-plastic rheology of Hunke and Ducowicz (2002) is also applied. For more detailed information on the model see Tsujino et al. (2006). The analysis scheme adopted in MOVE is a multivariate three-dimensional variational (3DVAR) analysis scheme with vertical coupled Temperature-Salinity (T-S) Empirical Orthogonal Function (EOF) modal decomposition (Fujii and Kamachi 2003). In this system, the model domain is divided into 13 subregions and vertical T-S EOF modes are calculated from the observed T-S profiles for each subregion. The 3DVAR results are inserted into the model temperature and salinity fields above 1,500 m by the incremental analysis updates (Bloom et al. 1996). For more details see Usui et al. (2006). In situ temperature and salinity profiles, satellite sea surface height (SSH) anomaly and sea surface temperature (SST) are assimilated. The temperature and salinity data including ARGO data are obtained from Global Temperature-Salinity Profile Program (GTSPP: http://www.nodc.noaa.gov/GTSPP/). The SSHA data is the near-real time along-track data of Jason-1 and ENVISAT obtained from Archiving, Validation and Interpretation of Satellite Oceanographic data (AVISO: http://www. jason.oceanobs.com/). The SST data is the Merged Satellite and In-situ Data Global Daily SST (MGDSST) produced by JMA. The assimilation run is implemented every five days, and the forecasting period is one month. The model is driven by wind stress and heat flux from the JMA's Climate Data Assimilation System (JC-DAS) in assimilation run and forced by the result of the climate forecasting model in forecasting run. The ocean model in the JCOPE1,2 systems is based on the Princeton Ocean Model with a generalized sigma coordinate (POMgcs) (Mellor et al. 2002). A high-resolution regional model with a spatial grid of 1/12° and 47 vertical levels is embedded in a low-resolution model covering the North Pacific region (30S-62°N, 100E-90W) with a spatial grid of approximately 1/4° and 21 sigma levels. The inner model domain covers the western North Pacific (10.5-62N, 108-180E) and its lateral boundary conditions are determined from the basin-wide model using a one-way nesting method (Guo et al. 2003). The wind stress and heat flux fields are calculated from output of 6-hourly NCEP Global Forecast System (NCEPGFS) or NCEP/NCAR reanalysis (Kalnay et al. 1996). Salinity at the ocean surface is restored to the monthly mean climatology data (Levitus et al. 1994) with a time scale of 30 days. The following observation data are assimilated into the model: the sea surface height anomaly (SSHA) obtained from the TOPEX/Poseidon and ERS-1 satellites during September 1999 to June 2002 and from the Jason-1 and the Geosat Follow-On during June 2002 to present; sea surface temperature (SST) obtained from the Advanced Very High Resolution Radiometer/Multi-Channel Sea Surface Temperature (AVHRR/MCSST) Level 2 products; and vertical profile data of temperature and salinity obtained from GTSPP. The JCOPE1 system (Mi-yazawa et al. 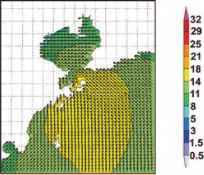 2008a) uses a combination of optimum interpolation for horizontal gridding of SSHA, SST, subsurface temperature and salinity data and multivariate optimum interpolation for creation of three-dimensional grid data of temperature and salinity. The temperature and salinity data are introduced into the model using the Incremental Analysis Update (IAU) (Bloom et al. 1996). The JCOPE2 system (Miyazawa et al. 2008b) adopts the 3DVAR scheme with vertical coupled Temperature-Salinity Empirical Orthogonal Function modal decomposition (Fujii and Kamachi 2003). The numerical model used is the ocean general circulation model developed at Kyoto University (e.g., Toyoda et al. 2004), which employs the hybrid o-z vertical coordinate to better simulate free surface motion of the ocean. To further enhance the representation of the upper ocean circulation, this model adopts some sophisticated parameterizations such as the Takano-Onishi scheme for the momentum equation (Ishizaki and Motoi 1999), the turbulence closure scheme for the mixed layer parameterization (Noh et al. 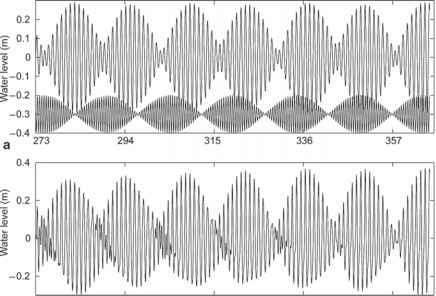 2005), the 3rd order scheme (Hasumi 2000) based on QUICKEST (Leonard 1979) for vertical advection, UTOPIA (Leonard et al. 1993) for horizontal advection and the isopycnal mixing scheme (Gent and McWilliams 1990; Griffies 1998). The model basin covers the northwestern North Pacific which includes the Sea of Japan and other marginal seas (see Fig. 17.1). The basic model resolution is 1/6° and 1/8° in longitude and latitude, respectively, and 78 vertical levels spaced from 4 m near the sea surface to 500 m at the bottom. Note that 67 vertical levels are set above 1,000 m depth. For the downscal-ing experiment focusing on the coastal circulation off Shimokita Peninsula, they employ the triple nesting approach from the above basic resolution (nest-1) to the finest resolution of 1/54° and 1/72° (nest-3) in longitude and latitude, respectively, via a medium resolution of 1/18° and 1/24° (nest-2). The nesting technique employed here is based on Oey and Chen (1992). The assimilated elements in this study are satellite-derived SST and sea surface height (SSH) data, and in-situ observation data of temperature and salinity. In detail, the SST data are from the New Generation Sea Surface Temperature (NGSST) produced at Tohoku University with a horizontal resolution of 1/20° and daily coverage. The SSH data are from the SSalto/Duacs gridded absolute dynamic topography, which is the sum of the sea level anomaly derived from multi altimeter data and mean dynamic topography (Rio and Hernandez 2004) provided by AVISO in time intervals of 3.5 days. The horizontal resolution is nearly 1/3° and the SSH data are interpolated onto the model grids for assimilation. The in-situ observation data are obtained from GTSPP. A 4D-VAR approach, optimized 4-dimensional datasets are sought by minimizing a cost function, in which the initial condition of model variables is chosen as the control variable. The cost function is composed of the background and the observational term. For more details, see Awaji et al. (2003) and Ishikawa et al. (2009). The NMEFC's operational forecast system for the western North Pacific (99°-150°E; 2°-45°N) uses POM with a horizontal resolution of 1/4° by 1/4° and 15 vertical levels. The model is driven by NMEFC's forecasts of a mesoscale atmospheric model. The data assimilation system utilizes OI for in situ observations (ship reports and Argo profiles) and a nudging scheme for MGDSST. The system produces a daily 3-day forecast of SST of the western North Pacific. 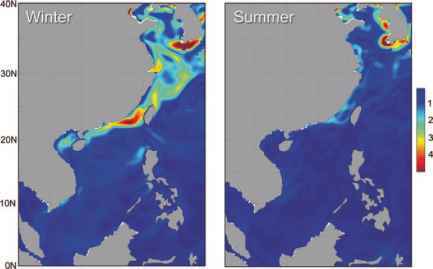 A Chinese shelf/coastal seas model based on a three-dimensional hybrid-coordinate ocean model (HYCOM, Bleck 2002; Chassignet et al. 2003) is used to simulate ocean circulation around China (Xiao and Zhu 2007). A curvilinear horizontal grid is utilized with an average horizontal resolution of 13 km. There are 22 layers in the vertical coordinate. Using the real topography, the model domain includes the whole CSCS and part of the West Pacific Ocean (see Fig. 17.1). The model was forced by ECMWF 6-hourly reanalysis dataset (Uppala et al. 2005). And the lateral open boundary conditions were provided by an India-Pacific domain HYCOM simulation (1/4° resolution). The data assimilation system has two alternatives: an EnOI scheme and the ensemble Kalman filter (Wan et al. 2008). The observations used for assimilation include GHRSST products, Argo profiles from GTSPP and SSHA from AVISO. Xie et al. (2008) compared several GHRSST products in the studied area. and west of 127°E, with horizontal resolution of 1/20° (lat.) by 1/15° (lon.) and 30 vertical levels. This is then embedded in a coarse-grid, 2-dimensional external surge model of larger extent. The undisturbed top layer thickness is 6 m in order to avoid tidal drying of the top layer, in which case the model would not be stable. The layers below are of 2 m thickness, with increasing layer thickness towards the sea bed. ESROM (East/Japan Sea Regional Ocean Model), based on the GFDL MOM3 (GFDL Modular Ocean Model version 3; Pacanowski and Griffies 1999), has been driven by monthly mean wind stress from the ECMWF reanalysis and monthly mean heat flux calculated by bulk air-sea flux formulation using ECMWF reanalysis meteorological variables. The surface salt of the model has been restored to that of the WOA hydrographic data. For the open boundary condition, a radiation condition with a nudging term for inward boundary fluxes is applied for the tracers and barotropic currents (Marchesiello et al. 2001). The barotropic velocity through the Korea Strait is given by the volume transport monitored by the submarine cable. Using the 3-dimensional variational assimilation routine (Weaver and Courtier 2001), the satellite-borne sea surface temperature, sea surface height (SSH) anomaly and temperature profiles have been assimilated. Kim et al. 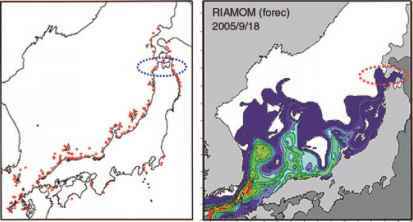 (2009) could verify the performance of the ESROM using an independent measurement dataset by the Pressure-equipped Inverted Echo Sounder in the Ulleung Basin located in the western side of the East/Japan Sea and suggested that the ESROM well reproduced the mesoscale variability as well as the general circulation. Some Japanese systems successfully predicted the Korushio large meander in 2004. Figure 17.2 shows the observations and forecasts of the Korushio main path in summer of 2004. The forecasts were made by MRI system. Fig. 17.2 The Kuroshio large meander formation in 2004. Top (bottom) panel shows the time sequence of the assimilated (predicted) current fields at 100 m depth. Vector and shade denote the current vector and its magnitude. The prediction stars on 1 June 2004 using the assimilated field as the initial condition happened on the 49er Medal course, at 16 in 17 August 2008. There is an abrupt change of the states of weather and sea. The mast of Danish sailors' sailing boat was broken due to a gust and rough sea. By borrowing a boat from the Croatian team, the Danes still won the gold medal. Figure 17.3 shows the forecast given by a fine resolution model (in a horizontal resolution of 2.5 km resolution) downscaled from YEOS forecast. developed by RIAM, Kyushu University (Hirose et al. 2007). Passive tracers were released from the both east and west channels of the Tsushima Strait at the depth of 0-22.5 m as artificial jellyfishes. Based on the sightings report around the Tsushima Island, the beginning of the tracer input was set on June 23. After August 16, the calculation was carried out by using predicted current data. The reproduction of the northward migration of the jellyfish was very successful; the northward front position of the jellyfish was in good agreement with sightings data within a few days, as shown in Fig. 17.4.
long circulations. A notable feature in this region is the vigorous interactions with the marginal seas, particularly with the Sea of Japan through the energetic Tsugaru Warm Current (TWC). In fact, coastal currents off Shimokita Peninsula exhibit a seasonally-varying circulation characterized by a transition of the TWC between two distinct patterns: a straight path along the east coast of Honshu Island in the cold season (hereafter "straight-path mode") and a swirl-like circulation in the warm season (hereafter "gyre-mode"). In et al. (2008) conducted a hindcast experiment for the year 2003 using a triple nesting approach. As a result, the system successfully reproduced the observed transition from the costal mode to the gyre mode and the subsequent opposite one. 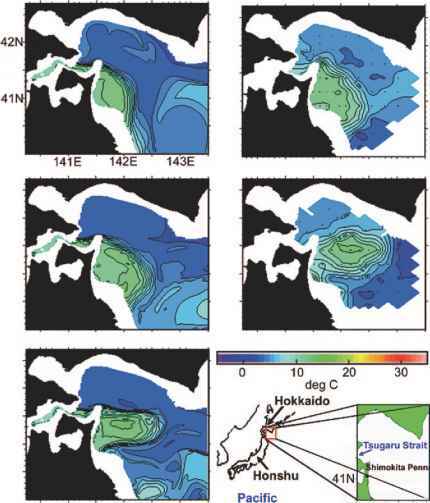 Figure 17.5 displays the time series of temperature distributions at 200 m depth, in which warm water of over 7°C that corresponds to the TWC water can be seen near Shimokita Peninsula in both the observation and the model. Interestingly, the warm water begins to extend offshore to form a gyre-like distribution. can be of O(1) m. The resulting surge can propagate along the southern coastline as a free or forced coastally trapped wave. An example in October 2007 is shown in Fig. 17.6 where the surge formed in GAB has propagated eastward to record a 0.7 m non-tidal sea level in the Gulf of St Vincent. The coastal trapped wave represented in BLUElink in this example has a wavelength of approximately 500 km and a period of approximately two days. The non-tidal sea level in coastal and shelf regions are frequently governed by a wide range of processes that are modelled in the BLUElink system including storm-surge, coastally trapped waves, boundary currents and eddies. BLUElink does not currently resolve tides, wind-waves, swell or river discharge. Evaluations from both the BLUElink reanalysis (Oke et al. 2008; Schiller et al. 2008) and the operational BLUElink 0ceanMAPSv1.0b (Brassington et al. 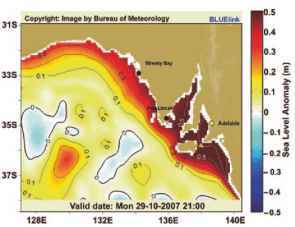 2007) indicate the non tidal sea level of these systems has low RMS errors and good correlations with coastal tide gauge (CTG) time series around the Australian coastline. 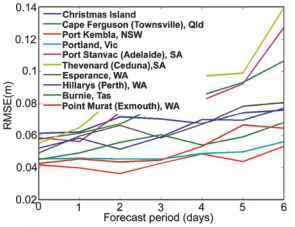 Figure 17.7 shows the RMSE scores for the forecast system over the 6 day forecast period compared with Australian tide gauges. During the period where the atmospheric forecasts have skill 0(48) h the non-tidal sea level forecasts have a RMSE range from 4 to 9 cm. At longer lead times the RMSE grows indicating that the error has not reached saturation. Longer periods of skill can be obtained from the coastal ocean processes. For example, coastally trapped waves generated in the GAB continue to propagate along the east coast of Australia reaching northern Queensland approximately 5 days after the initial disturbance. Coastal boundary currents and coastal eddies also contribute to anomalous coastal sea level over longer periods, particularly where the continental shelf is narrow. BLUElink has demonstrated useful forecast skill at combining the leading processes influencing non tidal coastal sea level. it is known that tidal fronts are formed in a boundary between well-mixed and stratified regions by the tide-induced mixing and are found along the west coast of Korea. Moon (2005) showed that the tide-induced mixing is to large extent responsible for the SST fronts along the west coast of Korea. Since our model does not contain the tides currently, the simulated SST missed the observed tidal fronts along the west coast of Korea. Generally there are about 2°C of warm bias in the simulation while in the summer the warm bias is about 1°C. And the bias can cause serious problems when using the model to produce a forecast without assimilating observational data. The aims of performing a hindcast experiment are two-fold. First we can evaluate the forecast system and identify problems for following trouble-shooting work. Factors influencing the accuracy of an ocean forecast include the errors in the forecasted atmospheric forcing, the ocean initial condition and the model errors. Using the atmospheric reanalysis as atmospheric forcing allows us to minimize the impact of errors in the atmospheric forcing and to examine the performance of the ocean model and its data assimilation scheme. It is a necessary step before the system's applications to operational forecasting. On another hand, the results from such a hindcast experiment can help us to understand more about the ocean predictability. The hindcast experiment started at the beginning of 2006 and ended on the last day of 2006. A 7-day forecast was conducted every 3 days with assimilation of the thinned FSTIA SST data once a day and the along-track SLA data once every 3 days. Figure 17.9 shows a schematic of the setups of the hindcast experiment. The forecasted SST is evaluated against the same FSTIA SST data by calculating the room mean square errors (here we made an assumption that the FSTIA SST data is the truth) over the whole model domain and three interested sub-domains: BYS (Bohai/Yellow Sea), ECS (East China Sea) and SCS (South China Sea). To compare with the data assimilative model forecast, we also made a simple statistical forecast using persistence a trivial predictor. the beginning of hindcasting, the RMSEs are zero for the persistence while the SST RMSEs in the model initial conditions are also small. As expected it demonstrates the benefit of data assimilation on the accuracy of the initial conditions comparing to model simulations without data assimilation. However the misfit of the initial SST field to the data shows there is room for further improvement on the data assimilation results. 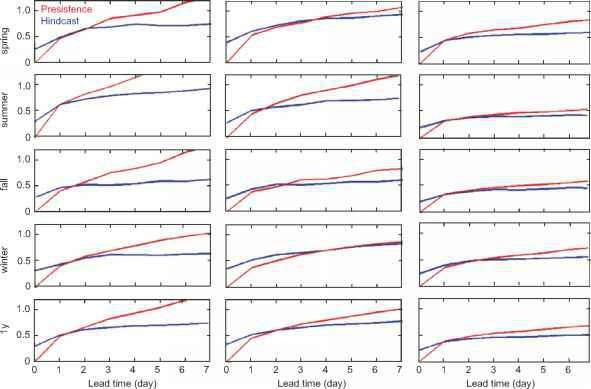 Over the whole model domain, the hindcast errors grow as the lead time increases. During the first two days the hindcast errors increases sharply from 0.3°C to 0.6°C. This indicates there are initial shocks on the model forecast that follow the assimilation by possible creation of gravity waves or other reasons. Then the growth slows down and the RMSE gradually reaches around 0.7°C. After 2-3 days, the hindcast beats the persistence. This shows that the model has an added value to the hindcast. The hindcast skills show seasonal dependence with the best skill in the fall season. The low hindcast skill in BYS during the summer is also obvious. The reasons will be discussed in the next section. Model hindcasts also show different skills in different regions. The order according to the skill from high to low is SCS > BYS > ECS in general. The lowest hindcast skill is in BYS during the summer. This region- and season-dependence is also supported by the skills of persistence. 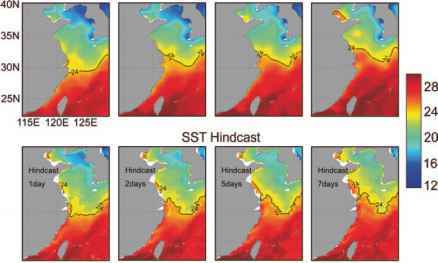 This fact indicates that to some extend the model hindcast skills are influenced by underlying dynamical processes in different regions and seasons and reflect the seasonal and regional short-term SST predictabilities. hindcast are shown in Fig. 17.11. The 28°C isoline moves southward during September 8 to 14 and the water with SST less than 28°C covers all the shelf area on September 14. The model hindcasts capture the two events successfully while the persistence cannot. thermal effect. The errors in wind have strong impact on the coast SST hindcast due to the upwelling and downwelling processes. Another reason may be the lack of tides in the model. As mentioned before, the tidal mixing has large impact on summer SST distribution in BYS. Fig. 17.14 The spatial distributions of the temporally averaged absolute values of the local SST spatial gradients over the winter and the summer of 2006. 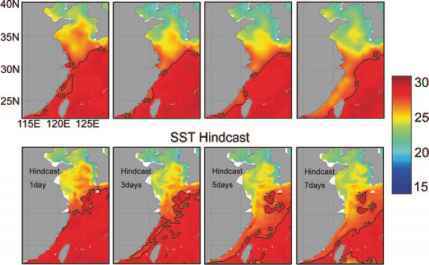 The SST analysis is used to calculate the gradient. The scale of color bar is 10-4°C/m values of the temporally averaged local SST spatial gradients over the winter and the summer of 2006. Instead in winter a strong gradient appears in the shelf between Hainan Island and Taiwan, Kuroshio path associated with the shelf break in ECS, Changjiang River estuary, and the area off the southwest coast of Korea. In summer the gradient is weaker than that in winter and shows its strength mainly around the Korea coast. The front patterns agree well with the previous studies based on multi-year remote sensing SST data (Hickox et al. 2000; Wang et al. 2001). The strong SST gradients agree well with the large hindcast error distributions in Fig. 17.12 especially in the Kuroshio path and in the shelf between Hainan Island and Taiwan. However, off the east coast of Vietnam and the Luzon Strait large hindcast errors exist but the SST gradient is only moderate. Considering the strong current there (e.g., Fig. 17.2 of Li et al. 2010), the horizontal advection errors may also cause a large hindcast error. During the GODAE period, several regional operational and preoperational systems have been developed in the Asia-Oceania region. These systems have demonstrated their usefulness via providing routine service for public, government and commerce users or by successful forecasting/hindcasting high impact (socially, economically and scientifically) events. All these regional systems have strong connections with the GODAE products. The Argo and GHRSST datasets are essential inputs for initialization of these forecast systems. The large scale GODAE products are also used to provide side boundary conditions (e.g., MOVE-NP). A 15 year ocean reanalysis from BLUElink has proved to be useful for engineering design. For example the modelling of internal waves through downscaling assisted the planning of the successful search of HMAS Sydney which was sunk during World War II. The BLUElink operational forecasts have also demonstrated to have good skills at forecasting a wide range of phenomena including: extreme coastal sea level, anomalous currents impacting offshore oil and gas operations, anomalous heat content over the North West Shelf influencing continental rainfall and many other processes. Most of these systems have been developed in GODAE related projects. For example, the 3D ocean forecasting system DMI BSHcmod has been continuously developed in the projects like in the MER-SEA and ECOOP projects. The MERSEA Baltic Sea forecasting system is based on the same model. It is still a challenging task to further develop the existing systems from science perspective (De Mey et al. 2009). Establishing more observation networks, increasing model resolution, adding sea ice model, using more advanced data assimilation and coupling with atmospheric models are among the near future activities. For example, in the near future, JMA will introduce an assimilation scheme of sea ice concentration to MOVE/MRI.COM-WNP, which would yield to some improvements not only in the sea ice extent but also in the ocean state of the subarctic region, especially in the Okhotsk Sea. JMA is also planning to develop a coastal ocean modeling/assimilation system using a high-resolution model with a horizontal resolution of a few kilometers that is intended for a possible operational use in JMA's forecasting and warning systems for the coastal region of Japan. BLUElink through a follow-on research project will also introduce an upgraded reanalysis and operational prediction system (mid-2010) and introduce a new coupled regional ocean-atmosphere system for tropical cyclone prediction. The global prediction system will enhance the eddy-resolving region to include the Indian Ocean and South Pacific and will also include advances in data assimilation, initialization scheme and atmospheric fluxes. Another challenge is how to further apply the achievements in Asia-Oceania operational activities comes from high-level decision-makers. The Indian Ocean is relatively less covered by these regional systems. GOOS-CLIVAR's effort in establishing the Indian Ocean Observing system (IndOOS) will improve the situation. Research Moored Array for African-Asian-Australian Monsoon Analysis and Prediction, a new observational Multi-national network designed for Indian Ocean, a subset of IndOOS, similar to TAO (Pacific) and PIRATA (Atlantic), aims to address outstanding scientific questions related to Indian Ocean variability and the monsoons. 22 out of 46 moored buoys are already occupied (McPhaden et al. 2009). On the other hand, Southeast Asian countries also urgently requires such a service for storm-surge forecast, coastal engineering and disaster prevention etc, and some existing systems such as YEOS system are ready to be extended to cover the entire NW Pacific coastal/shelf seas. There are encouraging signs of more Asia-Oceania countries plan to develop operational systems. A study on pre-operational oceano-graphic system will be funded by the Ministry of Land Transport and Ocean Affairs of Korea from next year. They will start to produce data products of coastal and environmental forecasts for the coastal waters around Korea. From a series of SST hindcast experiments in China marginal sea, we found that several following-up works are necessary. The initial conditions provided by data assimilation seem to have room to further reduce the analysis misfit to data. The causes of the visible initial shocks after the assimilation should be further investigated. Apart from the generation of gravity waves, other reasons should also be thought. Counillon and Bertino (2009) found a data assimilation set-up that produces little noise that is dampened within two days, when the model is pulled strongly towards observations. Part of it is caused by density perturbations in the isopycnal layers, or artificial caballing. Because the model used by them is also HYCOM, their results are very suggestive. The tide-induced mixing has strong impact on the thermal field in BYS. A higher resolution model setup than the present one, with tides is now running and will be used to perform new hindcast experiments. Acknowledgements Part of this lecture note comes from Zhu et al. (2008) to which co-authors: Toshiyuki Awaji, Gary B. Brassington, Norihisa Usuii, Naoki Hirose, Young Ho Kim, Qinzheng Liu, Jun She, Yasumasa Miyazawa, Tatsuro Watanabe and M. Ravichandran have contributed greatly. Chassignet EP, Smith LT, Halliwell GR, Bleck R (2003) North Atlantic simulations with the Hybrid Coordinate Ocean Model (HYCOM): impact of the vertical coordinate choice, reference pressure, and thermobaricity. J Phys Oceanogr 33:2504-2526 Chen D, Busalacchi AJ, Rothstein LM (1994) The roles of vertical mixing, solar radiation, and wind stress in a model simulation of the sea surface temperature seasonal cycle in the tropical Pacific Ocean. J Geophys Res 99:20345-20359 China Ocean Press (1992) Marine Atlas of Bohai Sea, Yellow Sea, and East China Sea, hydrology. 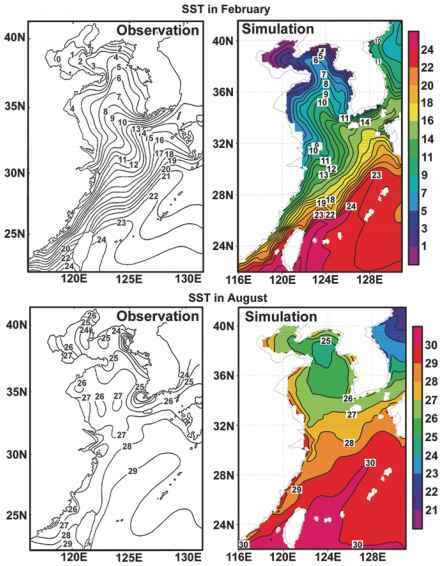 Miyazawa Y, Komatsu K, Setou T (2008b) Nowcast skill of the JCOPE2 ocean forecast system in the Kuroshio-Oyashio mixed water region (in Japanese with English abstract and figure captions). J Mar Meteorol Soc (Umi to Sora) 84(2):85-91 Moon I-J (2005) Impact of a coupled ocean wave-tide-circulation system on coastal modeling. System (BODAS). Ocean Model 21:46-70 Pacanowski RC, Griffies SM (1999) MOM3.0 manual. WWW Page, http://www.gfdl.noaa.